Free annotation tools, assignment limits, and other changes that were implemented in the summer of 2017. When change is near, never fear – the FAQ is here! 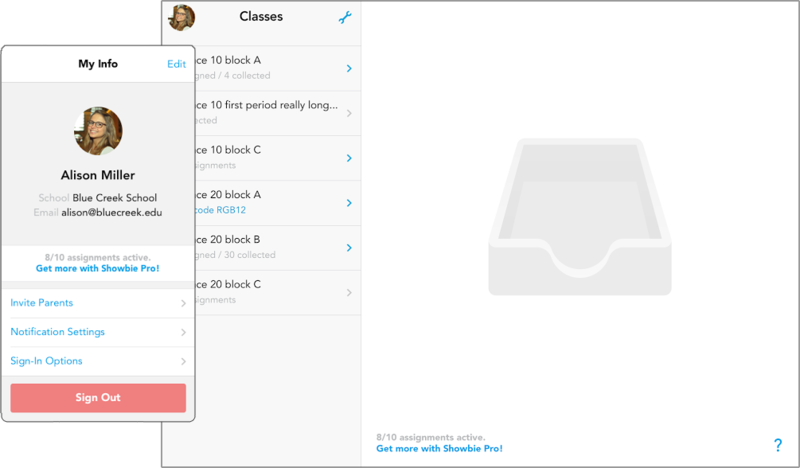 Showbie Pro is changing! There are a number of changes coming so we’ve put this page together to help keep track of how these will affect you. When do these changes start? How does co-teaching work now? What about my existing classes with co-teachers? What happens if I already have over 10 active assignments? How will this affect my students? In early August, all of these changes will go into effect. If you don’t have Pro, your existing assignments will be unaffected. You will still be able to access them like normal and you and your students can continue adding and annotating files. The steps to adding a co-teacher haven’t changed. If you don’t have Pro, other teachers cannot join your class but you can join a Pro teacher’s class. Nothing to worry about – classes with co-teachers approved prior to the Pro changes’ start date can still have those co-teachers. So long as an assignment isn’t archived or deleted, it’s considered an active assignment. For example, say you don’t have Pro and you have 5 classes and there are 2 assignments in each class: you have a total of 10 active assignments and you would not be able to create more. If you were to archive one of those assignments, you would have 9 active assignments total, 1 archived assignment, and you can create 1 more assignment. When you have 10 active assignments total, archive or delete an active assignment to create more. Make sure you have less than 10 active assignments when you use Copy Class or Copy Assignment – it won’t work if it puts you over the limit of 10 active assignments. You will still be able to access them like normal and you and your students can continue adding and annotating files. However, you’ll have to archive some before you can create new assignments. 10 is the magic number and once you have less than 10 active assignments, you’ll be able to create more assignments! The changes will allow students to have access to all the annotation tools available for PDFs and images as they will become free for everyone!